Here we are in November already! This Autumn has been flying by, as time does when one is busy every waking hour. Since first launching in the summer, I’m happy to report that Reglisse Noire has been enthusiastically received by perfumistas everywhere. In Canada, Reglisse is available in a stylish little boutique in Nelson called Habits. And in the US, Reglisse is now sold at the Scent Bar at 8327 Beverly Blvd in Los Angeles as well as on their new site dedicated to niche and artisan perfumers… Indie Scents. Recently, I was interviewed by Michelyn Camen from Cafleurbon… you can read it here. As well, please leave a comment following the article as 5 names will be drawn to win a 5ml pocket-size decant of Reglisse Noire eau de toilette. It’s been fun to google Reglisse just to see what it being said out there. It’s such an adventure to launch a perfume and then to watch its solo adventures out into the world as it’s discovered and experienced and shared by people whom I have never met. Here is an example- a sweet little review from the perfume blog- Perfume Smellin’ Things. There is also a listing here at Fragrantica, and Basenotes– Sniffapalooza Spring Fling recap. One of the things I have been asked recently is- ‘What’s next?’ Since I have been in Canada for most of this year, I have been yearning for Grasse with those sunny Mediterranean days and the perfume-infused culture. My heart is always there and so I will be returning next month to explore some new ideas. I have two perfumes on the drawing board and while one is still secret, the other will be dedicated to the well-being of the honey bee. This is a subject close to my heart and one that is of grave importance. The pollinators are suffering and dying, due to many human activities especially (super)pesticide use both in home gardens and on the large agro-farms. Without these little creatures, we will suffer major consequences to food production. So I would like to dedicate a portion of sales to really push for positive change. If any of you have suggestions as how to most effectively do this, I would love to hear your thoughts. Here I sit eating the most robust salad imaginable. Today is Saturday and with the slow arrival of Spring, the market up in the Place Aux Aires is starting to look more like a market in the south of France should with a number of local small farmers displaying their beautiful produce. I brought home a huge curly leafed cabbage and a head of lettuce that should really be included in a still-life painting. This is what I am now munching on, finely sliced and topped with Sicilian lemon juice and organic local olive oil so sweet it barely tastes like olive oil at all. (This I got at the market also, from the farmer, in a one litre wine bottle- price-14 euros) Top this off with a glass of chilled organic sweet Gewurztraminer from the region of Alsace, and I think my dinner qualifies as gourmet! Actually this is the appetizer, to be followed by lightly blanched baby broccoli and boiled organic eggs, also drizzled with olive oil and a sprinkling of sea salt from Normandy. And what of the stinky cheeses, you ask? Well, so far, the most pungent one I’ve had was a ewe pecorino from Corsica which was delicious but challenging in its fragrance. My favourite so far is still the Manchego from Spain. I haven’t really spoken much about school lately because every week has essentially been the same since classes began. Three days per week studying the synthetics and two, the naturals. Now however, we are approaching the end of this section, which likely, was the most difficult of the whole year. We have now studied about 200 raw materials, learned them mostly by heart (the process of memorizing never really ends), and I am feeling quite happy with my memory skills. Considering I have always struggled to remember place names, people’s names, and the like, I am very relieved that my olfactory memory is good. That said, I do notice that my memory recall in other areas has improved. It’s true it seems that the brain is like a muscle that gets stronger with exercise. My sense of smell has certainly improved greatly. It is a skill that can be learned, and this is intellectual, but also biological. At the beginning I could barely smell some of the materials that were unfamiliar to me, especially the synthetics that I had never smelled before, but now, I am registering them much more clearly and I am able to pick up more nuances every day. (especially lately, there seems to have been a sudden breakthrough in my olfactory system) I have to be careful because it’s like having to deal with a whole new set of materials as my sensitivity increases. I love the feeling of this sense becoming so much more acute. From what I understand, more receptors in the olfactory system are being activated through use and exposure to new molecules, perhaps ones that I have never tapped into before. Synthetic musks offer a very interesting example of this phenomenon. Musks are quite large molecules and can therefore be difficult to smell. There were two that I was not able to smell at first (musk ketone and musk T- so I took a tiny vial of each home with me to work on and found that by rubbing a bit into the back of my hand, I could begin to smell it.) Now, when one appears in a test, I can smell it quite clearly and am able to identify which one it is. Still, day to day, the sense of smell can come and go and be irritatingly fickle. It can also depend on the order of the materials that we smell. Materials can vary in their scent according to what you smell just before them. Complicated and fascinating! Another little bit of information that I love because, to me, it is incredibly interesting- is this- when you smell a fragrant flower, you are smelling its ‘headspace’. This is composed of the lightest most volatile molecules that the flower contains. The chemistry of this scent is quite different from the chemistry of the essential oil (water/steam extraction) or absolute (solvent extraction). Capturing these light diaphanous molecules is almost impossible and often replications are done with synthetic chemicals to copy the chemistry of this so-called headspace. 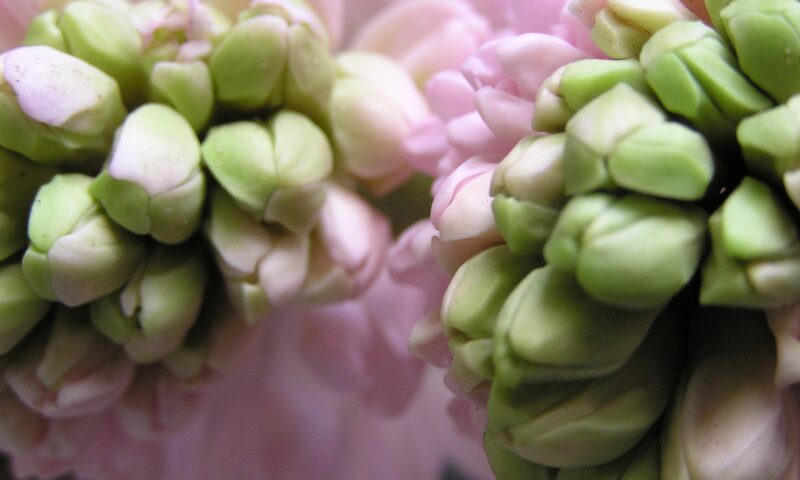 For some flowers, such as lilac and hyacinth, any extraction is impossible and the only way to achieve their perfume is to copy their headspace with chemical formulations. (there are sensitive machines that can identify main components of the perfume given off by a respective flower placed within it.) Well, to somewhat copy their perfume, since the volatile chemistry of plants is so complex that science has yet to identify all the components of any given oil or for that matter, headspace. The more they identify and can successfully replicate, the more naturals will be replaced with synthetics. Because of their incredible complexity, the eradication of pure naturals is not going to happen any time soon, thankfully! Besides, like I mentioned before, with the work being done in Russia and elsewhere, it is now known that there is a life force (or factor x) within natural molecules that cannot be reproduced in a lab. The next section of the course will be chemistry followed by formulation. Discovering science through a medium that I am already enamored with is fantastic! I am definitely falling in love with chemistry. So far I have not spoken in detail about my French culinary experiences, so this post in dedicated to food. To begin, today I made my deposit for the apartment and placed my online order with Ikea; so it’s official, I am diving into creating my new home. Negotiating the rental agreement with the estate agency entirely in French just about flattened me energetically. It is so deeply challenging trying to communicate very important official business without the usual ease of a shared language! Plus it is slightly unsettling to have to show all ones most personal documentation like bank statements and every possible form of ID to a complete stranger. The woman and I were very patient and apologetic with each other, however, and we accomplished the task, haltingly, but successfully. To celebrate, I stopped at a little gourmet shop just up the alley from my flat and began to taste bits from the sample plates of cheeses and meats and wander through the shop looking at all the goodies. I left with a package of finely sliced dried cured sausage called saucisson sec l’ancienne aux noixettes (traditional sausage with nuts -that unsliced smells exactly like a dog’s paw- that dry popcorn smell) and a little puck of what seems like a slightly aged soft cheese called Mistralou which is encrusted in a hard layer of pepper, rosemary and cumin seed. I already had the regulation baguette tucked under my arm (I have embraced eating bread!) and a bottle of good wine (Chateau Musset Chevalier Saint-Emilion Grand Cru 2003) at home that I found last week, so all that was left was dessert. This I decided could be accomplished with some Italian chocolate hazelnut liquer (Gianduia- ciaccolato gianduia e grappa) in the most beautiful bottle that I had noticed quite some time ago at the same little deli. For the main meal I have fresh pasta and a tomato sauce with green onions and pepper corns and dried olives already made from last night. So here I am, tucked away up on the top floor, it’s Friday evening after a very challenging week, sipping some lovely rich full red and eating chunks of delicious crusty bread layered with wafers of dried sausage, spicy cheese and slices of Provencal sun-dried tomato cured in olive oil. The pigeons are cooing away on the tiled roof across from my porch/perch, it is raining a bit, the weekly art exhibition is being set up in the square below and all is well in my world. Ordinarily, my diet consists almost entirely of organic food. It is so easy to find here, even at the Monoprix mainstream department/grocery store. I had prepared for the possibility of having to be a bit less picky in the area of food than I am in Canada, but it’s actually much easier here to eat healthy whole food. Most of the food departments have a great selection of Bio food, including meat and dairy. The only area that isn’t specifically organic is produce. Judging by the taste however, the veges don’t have nearly the chemical residues of conventionally grown food in N America. I spotted another indication the other day when a lemon in the fruit bowl molded- something that only organic citrus will do at home. Come Summer, I’m sure there will be lots of locally grown produce that is organic at the local Saturday market. The best thing about the market now is the honey table- delicious fragrant honeys of all kinds. Provencal honey is dark and lovely. For lunch, quinoa is my mainstay with chopped raw vegetables, olive oil and sea salt, along with bananas and organic yogurt. For breakfast I have an omelet or the very French choice- bread and coffee with some fruit. The other day I experimented and made crepes with fine cornmeal instead of flour. (let the batter sit overnight in the fridge) This was wonderful for breakfast and maybe a lunch option for next week. The one decidedly un-French thing I do most mornings is run out the door with my to-go cup of coffee or tea in hand! When I asked for a cappuccino to go in Paris in my nice stainless steel insulated cup, they would look at me blankly. I may be the only person in France who has one of these! Actually the concept of ’to go’ is not so familiar here in any form. My first night in Grasse, I took myself out for dinner at a romantic stone cellar of a restaurant and when I was too full of deep-fried chevre on greens and sweet chestnut stuffed tortellini in cream to finish said pasta, and asked for it to go, they cooked me a whole new serving and packed it up. It may well have been a misunderstanding based on the language barrier, but food or coffee on the run is not common here. My dinner is usually simple as well, with fresh pasta from the little shop around the corner, gorgeous sheep cheese from Spain called Manchego, and a salad or cooked vegetables. I eat eggs boiled quite often as well, and even had a ‘double-yoker’ the other day. The pasta from around the corner is like ribbons of silk. The man who makes it is carrying on the tradition of his father and grandfather in the same little shop. He jokes about it being the pasta museum, pointing out the old wooden tools used for rolling out huge batches of tortellini and cutting the ribbons of noodles. This man speaks some English and cheerfully helps me learn some of the basic French required when buying food. One thing that is common is pizza delivery. It took me a little while to realize what the story was with the tiny scooters who zoom around the city, painted in red and orange with a big cargo box attached to the back of the seat. These are the delivery boys from Mr Pizza. They seem to be everywhere and I’ve watched them from the phone booth, where I have spent hours in total since being here, that happens to be near the restaurant, zinging by fairly close to being airborn on every bump. One of the girls from school had a Mr Pizza delivered to class at lunchtime recently and I had a piece. It was very Italian style, unsliced and very thin. The only way to eat it is to tear off pieces and fold them in half to keep the topping from sliding off. There is an Indian restaurant up a narrow little lane nearby and a Vietnamese restaurant beside it. Neither of which I have tried yet, but I’ve heard that the Indian food is great. I’m taking my explorations slowly. I actually prefer to explore the grocery stores of a new country before the restaurants. Also, a huge reason why I avoid eating out is because of the cigarette smoke; I just can’t tolerate it. Besides, setting up a kitchen and cooking at home is comforting and coming here all on my own has caused me to crave some comfort every day. Today I bought a few of the basics for my new kitchen including one pot, 2 bowls, two plates, a set of glasses and cutlery. I’m hoping to find a shop with old china so I can have some unique pieces. I can hear that the party downstairs is picking up, so I think I ‘ll go see who’s showing this week. I think it is a sculptor, but I’ll let you know.